The highly exclusive world of high-end performance electric cars (EV) is welcoming a new player in the field, the Applus+ IDIADA’s Volar-E. It’s true that the reintroduction of the electric car has added some spice to the otherwise extremely boring last few decades. Until a few years ago, we had approximately the same but with a facelift every new year or so. The arrival of electric cars stretched both engineers and carmakers minds, as well as open doors to unconventional designs, straight out of the box spectacular and phenomenal electric cars. The Spanish Applus+ IDIADA is no stranger to the automotive world. Applus+ IDIADA Who? 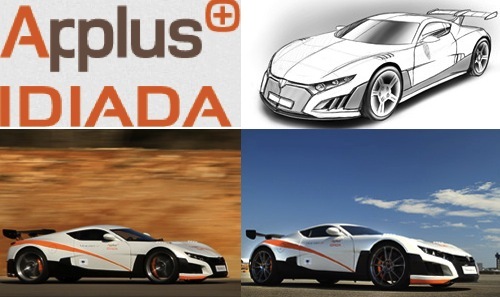 OK, so you might not have heard about Applus+ IDIADA unless you are an avid international alternative energy propulsion buff but the Spanish firm has an interesting prototype it claims is the world’s most powerful electric car. The international automotive industry engineering company created an innovative electric car prototype with truly high performance. According to the company’s press release, it will be comparable to or even better than conventionally-powered sports cars. Awarded the project by the European Commission in late 2012, in just four months Applus+ IDIADA exceed the original performance required by the EC, which stated among others expectations, a maximum motor power, fast-charging, regenerative braking system and aerodynamics. Technically Speaking: The original constraints were for a maximum motor power good for 1000 HP and to the vehicle 1000 Nm), some 737.56 ft-Lbs of torque. The battery pack technicalities are not yet available but the Volar-E accepts fast charging. With independent power control for all 4 motors, using the company’s iTORQ control system, such performance happens because of yet another wild and fantastic electric supercar, the Rimac Automobili. On Track. The prototype made its official debut late February this year at the Spanish Circuit de Catalunya during the F1 Test Days. With its experience in the provision of design, engineering, testing and homologation services, Applus+ IDIADA is hoping to be the Europe electric car flagship. According to Fernando Basabe, CEO of Applus+, "this project is recognition of the technological capacity of Applus + IDIADA in the field of engineering for the automotive industry." Carles Grasas, CEO of Applus+ IDIADA added that: "successful completion of the project in four months is the best demonstration of the capabilities of the company in engineering and project management. It’s interesting to see how the European Community is going about launching its electric car market. Electric cars are a tougher sale in Europe with their abundance of small, fuel efficient gasoline cars. In order for the electric car to stick to the public’s mind, it needs to strike a very high note, something Rimac Automobili, Exagon’s Furtive and Applus+ IDIADA Volar-E electric supercars is a welcome addition.